Classic Back-A-Line Back Belt with cotton lining. Lumbar stabilizing support with patented anatomic lumbar pad in a non-elastic belt improves spinal mechanics and posture. SALE - Closeout discontinued style. This is one of the most comfortable and well-made back support products we have seen. It has many professional recommendations and has been tested by thousands of people in the toughest of environments. 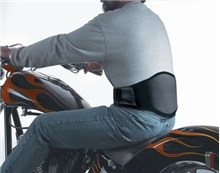 This unique lumbar belt provides a guaranteed fit, snug support and overall appealing design for incomparable comfort and back relief. It is perhaps the most durable and effective lumbar stabilizing belt on the market. Recommended to ease back pain associated with standing, lifting, carrying, bending, gardening, driving, riding, sports, and recreation. Some folks tell us they even sleep in it. At the core Back-A-Line's patented technology is a built-in orthopedically designed pad, curved and grooved to bridge the spine snugly. The belt is tapered to fit comfortably without pinching and pad shift. Can be worn over or under clothes. Covered under Medicare Reimbursement code # L0626. Made in USA. Tapered waist to hip differential fits comfortably without pinching or pad shift. Non-stretch construction supports abdominal weight and minimizes change in center of gravity. Strong Velcro straps hold belt snugly in position. Secondary safety compression strap ensures lumbar support even in the most strenuous work and play environment. Durable polyester with a cotton lining. Worn over or under clothing. In sizes for waists from 23"- 48". Curved to promote correct posture. 8" tall to support the entire lumbar spine. Provides proprioceptive feedback to improve spinal mechanics. Lumbar pad is a bit stiffer and takes some breaking in to soften and contour perfectly to the spine. Disclaimer: We make no claim that the Back-A-Line will prevent back injury. There is some research showing improved spinal mechanics with use of this back belt technology, and that the back muscles work more efficiently when it is worn. However, proof of injury prevention would require many years of study, following one group of users who faithfully wear the support daily and a like group of users who don't, with both groups exposed to the same physical activities and risks over time. This kind of research is not realistically possible. * Be sure to read our Use & Fit guidelines prior to purchase. if you have put on some weight and your waist has become bigger than your hips, the manufacturer instructs to use the Back-A-Line/Back Jack upside down. The belt is contoured to fit the waist-hip differential. If the waist is smaller than the hips, use the support right-side-up (with the wash tag facing UP). If the waist is same or larger than the hips, use the support upside-down (with the wash tag facing DOWN). Then it should snug into your lumbar spine as it should. The shape and fit of the Back Jack is the same as the old Back-A-Line. Back-A-Line is not for everyone. Those with spinal anomalies – scoliosis, spinal fusion, kyphotic posture, spinal stenosis, advanced arthritis, etc. – may NOT be able to adjust their spine to the curve of the lumbar pad, making it somewhat uncomfortable and ineffective. There is no harm in trying, but unless your spine has enough flexibility to accommodate a lordosis, the belt cannot provide effective support. That category is about 5% of the population. 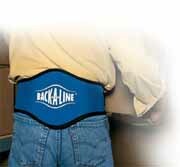 But Back-A-Line works for most people who have moderate to severe lower back pain or fatigue problems. Waist size does not equal pant size. Use a tape measure! Measure your waist. Put the measuring tape around your torso in the same place you would normally put a belt around your pants. For those with a waist bigger than hips, have the measuring tape follow the same angle you normally wear your pants. Most people wear their Back-A-Line support OUTSIDE of their clothes, and take this into account when measuring their size. Size ZZ (for 48"+ waist size) does not have a secondary compression strap attachment. The manufacturer advises that a secondary strap becomes unwieldy in this size because of its length. Instead of wrapping the belt around at your belly button, start with the L-pad in the middle of your spine but wrap it on the diagonal about 2 – 3 inches UNDER your navel. Lift your stomach, attach Velcro and allow your stomach to fall into the non-stretch belt. It not only snugs up the fit but it will carry most of your belly weight. You won’t have to hyper-arch your back for balance. Skin irritation may occur with direct contact of the rubber material. Persons with known susceptibility to dermatitis or with broken skin should wear the support over clothing. Machine wash warm. Air dry. Do not machine dry. Do not expose to high temperatures, as this may damage the molded lumbar pad.